How many cords do you need to travel to france??? I borrowed a DVD player from friend. Noticed that the AC adapter for the wall charger was missing, so, I decided, surely the igo would sell a tip to convert and charge it at the airport. I then visited my neighbors. They were taking us to the airport this morning so I thought we should discuss departure time. 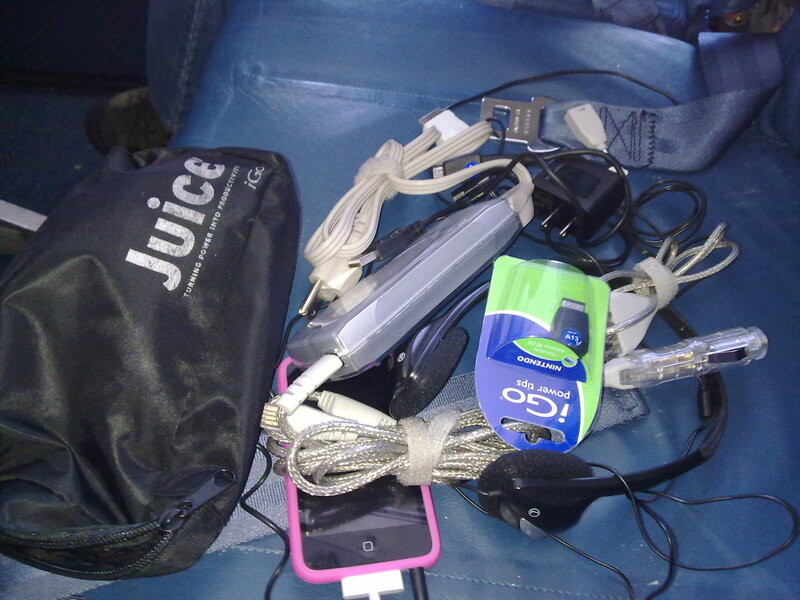 During the discussion, B mentioned she has an igo as well, it has a huge charger with all sorts of cords and such. I thought, “Great, I’ll borrow hers and return mine…saves me some $$” We woke up this morning frenzied, but not too crazy. S dropped us off at O’Hare, we made it through screening with not one single problem. As I was putting the laptop back in the bag I realized…..I forgot the laptop charger. AGHHHHH. WTF??!! So we made it to our gate, I took the sack of igo cords and pieces and went to Brookstone. They do not sell an igo tip to go with the laptop or with the DVD player. So, here I am, completely panic struck. What am I going to DO? I finally decide to by an igo laptop charger. $89 later I am sitting in the flight waiting area and I decide to charge the itouch. Well, the little tips I do have don’t fit on the apparatus that the neighbor gave me. Not only that, but I left the itouch wall charger where?? That’s right folks, plugged into the WALL at home. So, I have the laptop issue figured out, I now have to buy another converter to plug into the laptop to charge the phone and Nintendo. What about the DVD player you might ask? Not only does it not have a wall charger, but the charger that plugs into the cigarette lighter in the car is broken. I should have stuck with my first instinct and focused on charging things in case we have no wall power. But, I got all sidetracked with cords, power and buttons. As I sit here on the plane $100 poorer with no good solutions, I am reminded that the kids can actually draw or read if they get too bored. It is a good thing too, cause I forgot the DVD case at home anyway. Here is a photo of just some of the cords and attachments I have. Mind you, they don’t work.